In this manual (handbook) unique information and description of 120 plant species from 13 taxonomical families are presented. Description of each species includes habitat , ecology, economic value, fruit morphology and biology of seed germination by considering impact of temperature. For most of the species , influence of salinity on seed germination is also described. Each species account is illustrated with a general view of plant, and where ever or necessary details of fruit and seed morphology are given. The reasons of various seed germination rate were analyzed based on the structural and functional characteristics of seed coats. A summary table showing the optimum temperature needed for seed germination, length, type and methods of breaking seed dormancy, as well as stimulation of seed germination is provided at the end of this handbook. Passport of t he seed sown quality is also given. 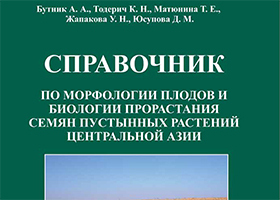 It is hoped that this book is useful for practitioners, farmers, agropastoralists and researchers dealing with introduction of wild desert plants into culture.